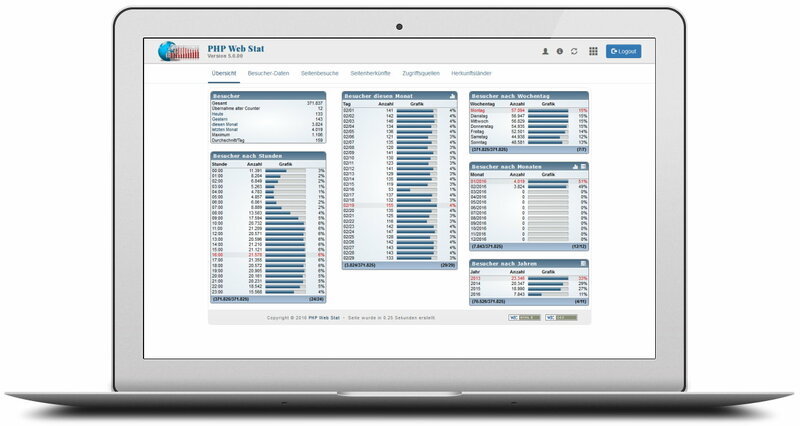 PHP script for the tracking, graphical and textual analysis of website visitors. Since version 5.x, PHP Web Stat now also allows the integration of plugins (modular extensions), which provide additional functionality for a user. The user can go back and forth on a daily basis to analyze the entries for a calendar day in detail. A built-in calendar allows you to jump to a desired date. In addition, the number of entries to be displayed can be specified. The Plugin is rounded off by a detailed origin recognition of the IP address of the visitor over a freely selectable GeoIP service. The plugin can be adapted to the needs of the user by means of a clear configuration. The plugin records the clicks a visitor makes on a link or a file and evaluates this data. For each click, the user receives an individual evaluation of the total number and daily clicks. The plugin generates weekly or monthly reports from the recorded statistical data and sends them to recipients of your choice. These reports include the total number of visitors since the time of recording, the number of visitors in the current month and year. To enable PHP Web Stat to automatically recognize the country of origin of a visitor, current country recognition patterns are always required. These are made available monthly free of charge on the PHP Web Stat website. This plugin checks for updated country recognition patterns and installs them automatically. No need to enter the statistics, updates are automatically detected and installed in the background. The plugin shows the page visits (accesses) of the users, once the months and once the years in two curve diagrams. This view allows the user to see the long-term trends in the number of pages visited since the installation of PHP Web Stat. The plugin shows the visitors and their page visits (accesses), once of the last 10 days and once of the last 30 days in two graphs. This view allows the user to see current trends in the number of visits and pages visited. The plugin generates four pie charts from the statistics data, which display the statistics modules browser, operating system, screen resolution and screen color depth. This website is optimized for Internet Explorer 9, Chrome, Safari and newer browsers. Copyright © 2003 - 2019 PHP Web Stat · All Rights Reserved. Copyright © 2003 - 2019 · All Rights Reserved.